the book came to me ! Rob wrote an easy reading book, full of eye-openers. This book is a must read if you want to create a better health and feel the vitality of your body and mind. A book you keep on the shelf and pick up whem you need some feedback on personal issues. A well written book that gets to the core of getting healthy. Intuitive eating isn't good enough. With 'Nutrition' you will leap into vitality. Superfoods, supplements, life style and self monitoring. Just too much to mention. Get the book, it's an easy read! Dr. van Overbruggen's book provides a much needed -wake-up call- to take charge of your health or likely risk the dire consequences. His style in uniquely engaging,energizing, and very interactive with the reader. It is certainly worth your valuable time to place yourself on the road to radiant health. There is one place that nearly everything that matters today in the world converges. It is our fork, and what we decide to put on it every single day is of utmost importance. Food and the way we produce and consume it, is the nexus of most of our world's health, environmental, climate, economic and even political crises. We need a real food revolution exactly the kind that Rob A.A. van Overbruggen simply and evidently described in this book. As a doctor, it is my job to figure out the best way to keep my patients healthy. We now know that food is medicine, perhaps the most powerful drug on the planet with the power to cause or cure most disease. If food is more than just calories, if food is information that controls every aspect of our biology and health, then I better know what to advise people to prevent treat and even reverse chronic disease. In this this book, Rob talked about facts that amazed me but it’s the ugly truth as he said, and we all must know it. You’ll enjoy your reading journey from the start till the end with up-to-date, evidenced based information that will transform your life. I would like to express my sincere gratitude to Rob A.A. van Overbruggen and to take this opportunity to let you know how much I respect and admire you as a dedicated professional who has a message to deliver to all persons all over the globe. believe it or not, only today I could stay and have a look on your great masterpiece! I can't believe that you could provide such guide, in my opinion, such a book should take you a lifetime…….but instead, it is for a lifetime! Congratulations, it will take time for me to follow all the steps, and I am sure many of my students and healthcare professionals which I interact with, will take advantage of this valuable guide. actually it's so great to share your incomensurable experience and knowledge……. I am sure the few words that I have send to you cannot express my "wow" for your expertise and all you have done for all mankind. You are really great!!!!!!!!! Please don't stop, keep on, you do things wonderful! Prof. Dr. M. Maes MD Ph.D.
Read More from Prof. Dr. M. Maes MD Ph.D. The book came at the perfect moment, when I had already committed to honouring my physical body more, in order that I can live a long and healthy life. 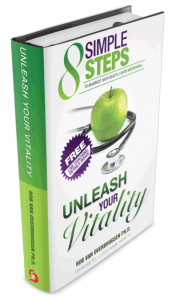 The Unleash your Vitality – 8 simple steps to maximize your health with nutrition gives me the tools to do just that, by providing great insight into health and wellness through the medium of diet and supplementation. As a mind: body: spirit based therapist, using meta health, EFT and Matrix Reimprinting, I have worked with the emotional connection between health and disease to great effect, supporting myself and others to release diverse symptoms and to feel better. I began to look for solutions to improve my personal vitality through what I put into my body on an ongoing basis – nutrition – the building blocks of life. The book explains in simple terms what happened to our food and water, and how to achieve nutritional balance, with the promise of feeling great! The material is presented in a readable fun way, distilling complex messages into easily digestible bite-size chunks. I like the tests and supportive (quite firm) guidance to enable you to get from where you are now to your desired health goal. I was already negotiating the supplement minefield, so the information in this book has taken the stress out of making healthy choices. I decided to use the supplements suggested in the book and I am already feeling the benefits. So much so, that I have decided to be a coach, sharing the information with others. In this process I will learn even more and support others to achieve their vibrant vitality too. A comprehensive, cogent guide and workbook on salutogenesis: a focus on health creation and self-efficacy in a soon-to-be bygone era of disease care. Dinner is destiny, per lifestyle medicine expert David Katz. 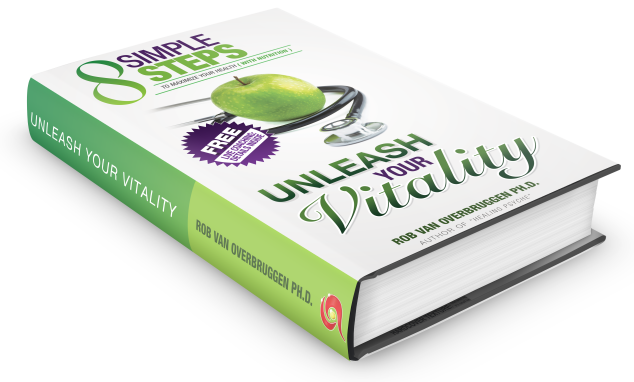 If you want to upgrade your destiny, dive into Dr. van Overbruggen’s fabulous book titled Unleash your Vitality – 8 simple steps to maximize your health with nutrition. Every cell in the human body needs a complex set of nutrients to perform at its best. This book is an engaging and thorough reference and summary of the contribution to nutrients to human thriving. I love this book! Being an avid follower of all things health related I was delighted when this gem came my way. Having experienced amazing personal life-changing success for myself, and my family with nutritional healing through diet modification and supplementation, I became joyful and content as a side effect. I would like these feelings to become contagious! Therefore, I wholeheartedly agree with Rob van Overbruggen’s mission to fully empower all of us with the understanding that improved diet and nutrition enhance wellbeing and overall vitality. medicine by symptoms. As an integrative and functional medicine practitioner, I feel strongly that we are on a verge of a true transformation in medicine. Unleash your Vitality – 8 simple steps to maximize your health with nutrition contributes to spreading the knowledge of what creates health. It engages the reader in the concepts of what restores balance by getting to the root of the symptoms. Rather that promoting a pharmaceutical symptomatic intervention, the books illustrates what primarily causes dis-ease and what nutrients are able tore store balance in dose-dependent manner. 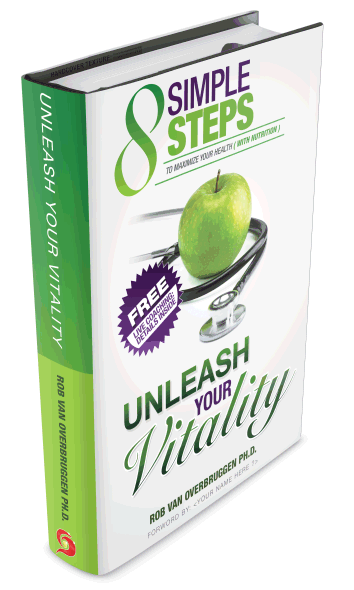 The time is certainly ripe for a radical transformation in health ‘Unleash your Vitality – 8 simple steps to maximize your health with nutrition’ clearly offers all the tools for this change to occur. Unleash Your Vitality hits the bull’s-eye for all those seeking an answer to good vitality, with inside information that is rare. There are plenty of books out there with information on how to live, but this is a book I wish I had at my start of my career, 33 years ago when I was building my interest in orthomolecular medicine. This book is innovative, no-nonsense, packed with up-to-date information and with literature references. It shows that there really are ways to improve your health: those who want to make effort can reach out and change their lives. As an orthomolecular educator for many years, and also a orthomolecular therapist I can recommend this book as a genuine start for those who are interested in orthomolecular medicine and healthy living. It is not only for people with existing diseases, but especially for people who want to prevent disease. Go for it! A clear and practical book. With lots of information about nutrition, which not only remains information, but is also directly practically applicable. Rob says it is a book about nutrition, but it goes beyond just food. Because knowing a lot about nutrition is one, but what does it do with my body? That’s the question. And the answers are in the book, when you work it trough. The maxim: ‘an optimal nutrition for optimal vitality’ is sure true and to achieve with this book. We would love to hear your experience too !! Some people find it hard to write an endorsement because they do not know where to start. The following questions might help you and give you inspiration. What is your main takeaway from this book? Your main insight or lesson ? How will you implement that main takeaway? What will you do different from now on? If this book is not for you, then who is it for ? How would you recommend this book to others ? What are your personal results from reading and working with this book? Please copy your endorsement onto the amazon sites so more people can enjoy this and unleash their vitaliy. Unfortunately Amazon does not copy the endorsements to other sites or to other versions. You help is greatly appreciated in this. Just copy your testimonial to all of the following sites. THANK YOU !